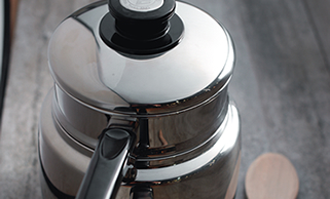 Buying a brand new range of cookware can be a daunting task with so many options available. To ease the conundrum, consider your cooking needs, level of cooking and how much are you willing to spend. It can be tempting to simply purchase a complete cookware set since it will include everything a kitchen would need. Unless you are a professional, owning a couple of basic pots and pans will suffice for most recipes. Your money is better spent on fewer quality wares that are durable. Skillet: A medium size skillet (approx. 10 inches) can be use for sautéing and stir-frying meat and vegetables. Saucepan: A heavy bottomed 1.5L saucepan will be ideal for making sauces, steaming vegetables and cooking small quantities of pasta or potatoes. This is one of the most versatile cookware in the kitchen as it can handle both solid and liquid recipes. 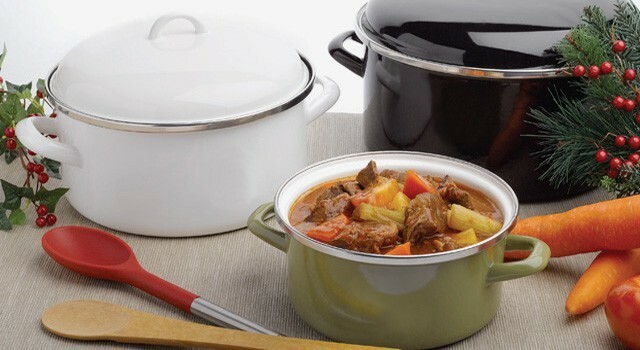 Stock pot: Depending on the number of servings, stock pots generally range from 6L to 10L. You can make a larger batch of soup, pasta or even cook an entire lobster. Heat conductivity: In terms of cookware, heat conductivity refers to the ability of the cookware to heat the food fast and evenly. Durability: Stainless steel is a good example for durability as is can maintain its original state for a long period without much maintenance. Reactivity: Some material reacts with certain foods. Aluminium, for example, reacts with acidic ingredients meaning that the food can absorb a small amount of metal. This is an important factor to note. Price: The amount you are willing to pay will most likely determine the kind of cookware that is purchased. Always buy the best that you can afford. Maintenance: Some materials have higher maintenance than others. Copper and cast iron usually require more work to be done compared to stainless steel. Individuals should think about the time they are willing to spend on maintaining their cookware. Despite being an excellent heat conductor, aluminium can get scratched and dents easily. It is usually treated through a process known as anodization. This process places a layer of aluminium oxide onto the surface making it scratch-resistant as well as ensuring that it does not react with foods. Aluminium cookware is often finished with a non-stick coating to ensure food remains unburned. Also, most aluminium cookware is relatively cheap in the market. Heat source: All heat sources except induction, otherwise stated. Cooper cookware is commonly used among professionals as it is an excellent heat conductor which means better temperature control when cooking. A heavy gauge copper pan will respond almost instantly to the heat source as it is switched on or off. With such great conductivity, you can cook with low heat. Copper is sometimes found wedged in between stainless steel to minimise its reactivity effect. The downside would be that copper needs to be regularly polished to maintain its surface and usually commands a premium price. Heat source: Gas, radiant, solid plate and solid fuel hobs. Stainless steel is a durable material that is generally easy to cook with and easy to clean. Most stainless steel cookware is made from 18/10 stainless steel – that is 18% chrome to prevent rusting and 10% nickel to prevent tarnishing. However, stainless steel is a poor heat conductor. Most stainless steel cookware has a layer of highly conductive metal at the bottom and some lined throughout the cooking vessel for better heat distribution. Heat source: Gas, electric and solid fuel hobs and some specifically for induction. Cast iron is an extremely durable material with good heat retention. This metal is so efficient that these pans only need a low to medium heat. Never heat a pan that is completely empty. Avoid sudden changes of temperature such as putting cold or warm water into an empty hot pan, or by placing a hot pot on a cold surface. Like copper, cast iron cookware needs constant maintenance. This is generally done by lining a layer of oil on the cooking surface after cleaning the cookware and heating it over small heat until a wisp of smoke can be observed.